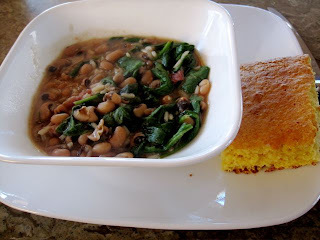 Southern tradition dictates we eat hoppin' john and greens on New Year's Day to ensure fortune and luck in the coming year. Often it is peas cooked with smoked ham hock, rice, and some sort of greens as separate dishes. Way too much trouble in an RV. Here's my humble version: Peas and smoked ham hock cooked overnight in a crockpot, rice added about an hour before eatin' time, and a couple of handfuls of fresh spinach a few minutes before serving, just to wilt. Add tabasco at the table to taste and serve with cornbread, of course!! Yum, Yum, Yum . . . yawn - time for a nap . . .
With a dish this good, everything will be fine in 2010. Yep - it's a word. Hmmm - did you mean "hambone" as in "tickle dawn"? Yall better stop with the nicknames! Ha! Just make me some skillet cornbread in a couple of weeks and I will be happy girl!